Unknown knight of 15 c.
Re: Unknown knight of 15 c.
nice painting. I would use some white for the extrem highlights of the armour. And here is the painted figure. It was also an experimental work, since this was the first time I used the "painted" plate-armour, so I did not use metal paint for the representation of the metal parts. Yes, the helmet is a sallet or "Schaller" in german. It was the most popular type of helmets at the end of the 15th century. There were alot of local styles and often it was painted. I think there should be a english version of it too. Thank you Willie for the information. In the meantime I am almost ready with the painting of the figure, so I shall post a picture soon. However in the last week I was busy with the renovation of our kitchen, so I had no time to paint. Rebuild of a kitchen is a terrible thing - I propose to try to escape it (there is one thing is even worse: the renovation of the bathroom, it is terrible and lasts long). Thank you Jan for the pictures. Any information about their availability (editor) would be appreciated. I would be also curious about the "topic" of the series - it seems as it represents a siege. I´m interested in to know the numbers of following figures. At the first picture into the first line the figures 1, 2, 3 and 4. 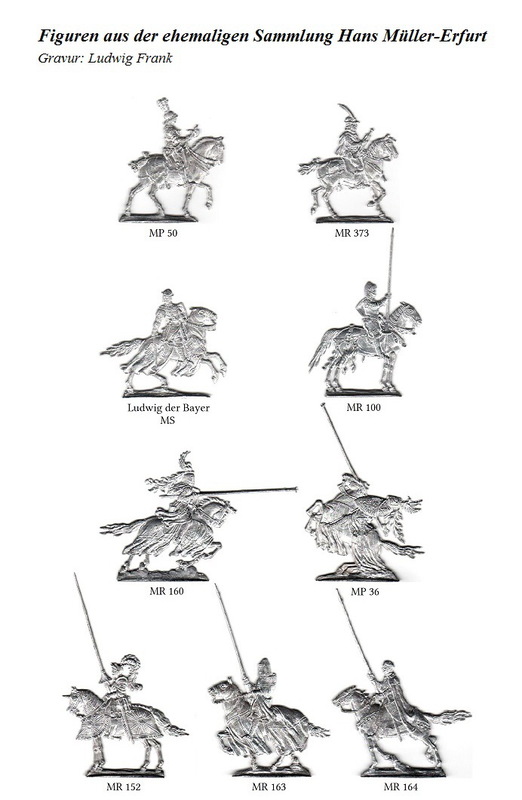 These figures are not available from Hans Schwahn in my opinion. See what I found in a drawer of mine, a set of marching soldiers leed by your Knight. All once produced by Hans Müller. Thank you very much, for the information Henry! the original Editor was Müller-Erfurt. The owner of the mould are Wolfgang Friedrich now. In Kulmbach you can visit Mr. Friedrich. The other flats on the table are also distributed by Mr. Friedrich. Exatly this one it is! There are no further informations, sorry. 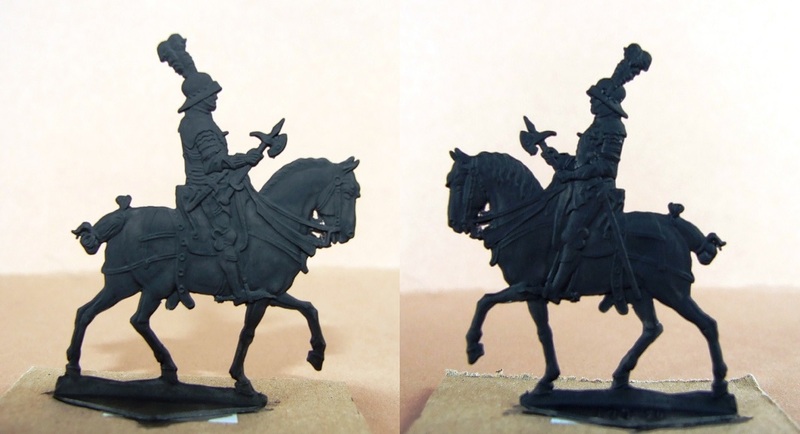 Elated on the Murten-article in the Journal 128 I look around in my spares for my Gottstein-Murten figures. 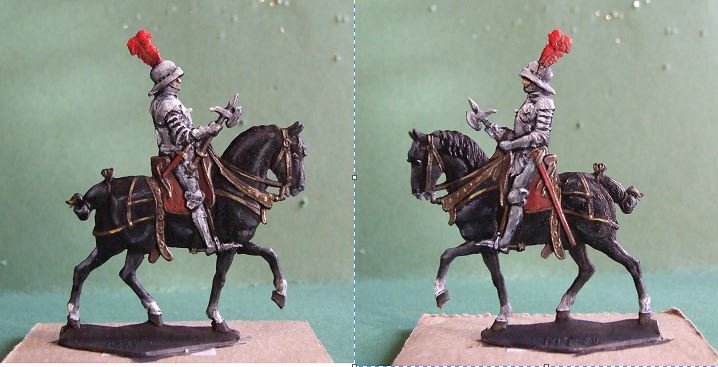 I came across this mounted knight figure marked by L. Frankon the plinth and on the other side is read MP 50. It is not listed neither in the Karl der Kühne nor in the Schlacht bei Murten series of Gottstein/Blum, but it seems to be from the end of the 15 c. and according to the form of his helmet it might depict a Burgundian knight. Any further information would be welcome!